Opening remarks. From left to right: Vicente Plata, Officer in charge of the FAO representation in Uruguay; Denise Cook, Resident Coordinator of the United Nations System, and Resident Representative of the UNDP in Uruguay; Adrián Tambler, in representation of the Ministry of Livestock, Agriculture and Fisheries. 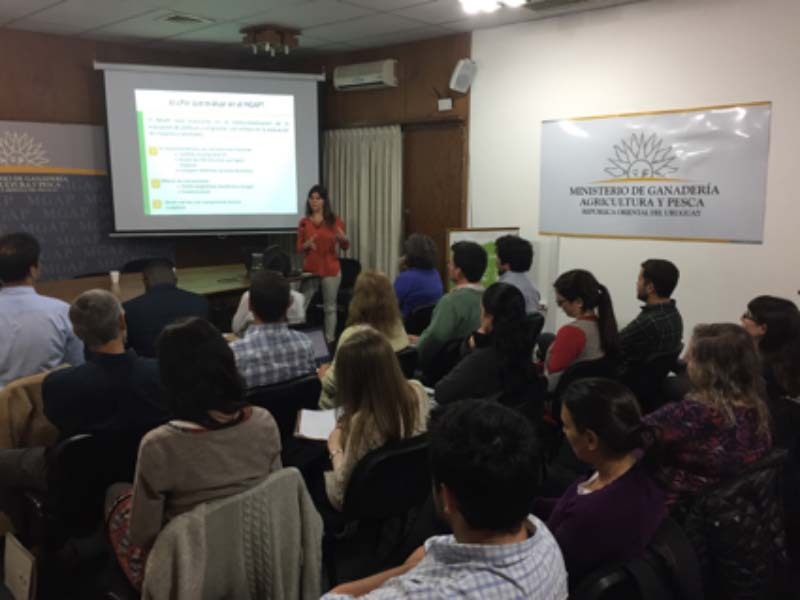 Montevideo, Uruguay, 24-28 October, 2016 - The National Adaptation Plan for Agriculture Project organized an outreach activity to present the impact assessment strategy of the Ministry of Agriculture, Animal Production and Fisheries (MGAP) of Uruguay. Minister Tabaré Aguerre prioritized the systematic evaluation of the interventions deployed by MGAP. During the activity, Verónica Durán presented the work done by the Office of Agricultural Programming and Policies. 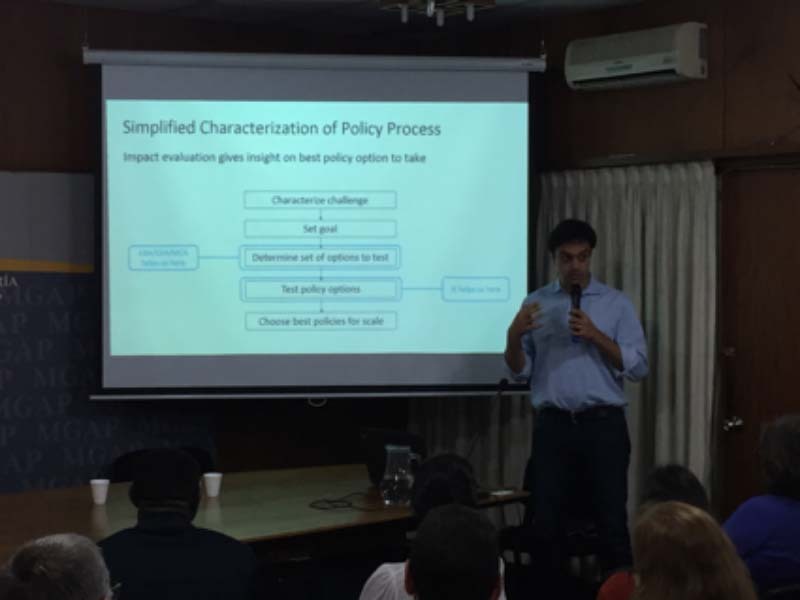 A team of economists, agronomists and anthropologists has been working for the last two years in the application of a mixture of quantitative and qualitative tools for impact assessment of agricultural interventions in Uruguay. The activity was supported by the “Integrating Agriculture in National Adaptation Plans (NAPs)” programme, a collaborative initiative of the Food and Agriculture Organization of the United Nations (FAO) and the United Nations Development Programme (UNDP) that is funded by Germany´s Federal Ministry for the Environment, Nature Conservation, Building and Nuclear Safety (BMUB) through its Climate Initiative (IKI). Dr. Ali Akram (FAO) and Dr. Babatunde Abidoye (UNDP) were invited to present methodological aspects of impact evaluation and their experience during the evaluation of interventions in different fields. A diverse audience of various ministries, research and academic institutions and divisions of MGAP participated in the event. During the next four days, a capacity development workshop was held, focusing on concepts and methods of impact evaluations geared toward professionals working on impact evaluations. Dr. Abidoye and Dr. Akram shared their experience in impact assessment of public interventions in various settings. The sessions combined lectures and discussions about national and international cases of impact assessmenst. Best practices of impact evaluation, theory of change, indicators and advantages of different methods were discussed by the participants. There were fruitful exchanges about the value of designing interventions with a view of the tools to be applied to evaluate its effectiveness and impact. Actual cases were discussed and ideas were exchanged in relation to what are the ideal procedures for effective ex-post evaluation. This technical workshop served as an opportunity for integrating impact evaluation into the design of programmes and actions focused on mitigation of greenhouse gases emissions and adaptation to climate variability and climate change at the MGAP. Participants gave high marks and positive feedback, as the impact of the event greatly exceeded expectations. An active discussion was held about the needs of taking into account impact assessment during the initial phases of project design. The Agricultural Sustainability and Climate Change Unit of the MGAP leads the NAP-Ag process in Uruguay through capacity building activities designed to strengthen and integrate evidence-based methods for decision making in national planning processes that increase adaptation to climate change in the agricultural sectors. Ali Akram (PhD) is an Environmental Economist, Professor at the University of Yale and a FAO international expert. He has academic and professional experience on impact evaluation of diverse public policies in different countries. Babatunde Abidoye (PhD) is a Development Economist, and professor of the University of Pretoria. He has over 15 years of experience in economic analysis and evaluation for UNDP, including the Ecosystem-Based Adaptation project (EBA) and the Economics of Climate Change Adaptation Programme (ECCA). He has recently worked with UNDP on impact assessments in more than 11 African countries.